Tar Sands Mining: Well, Canada is sorta big right? It is one thing to say that the Athabasca tar sands mining project is a behemoth- quite another to actually see it. Here at SkyTruth we have always recognized how powerful a story real-world images can tell. 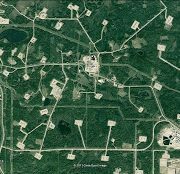 Check out our newest addition of satellite “truthing” – A quick animation of the growing Athabasca tar sands mining “footprint” and future extent. Big tip o’ the hat to Global Forest Watch Canada for providing the mining data. We have placed the boundary of Washington, DC on top of one of the open-pit mine locations to give viewers a sense of just how vast this whole operation is. 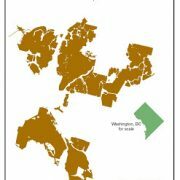 Have any of you ambitious tourists ever attempted to walk the length of the National Mall from the U.S. Capital to the Lincoln Memorial? It’s farther than it looks (as my feet will attest) – about 1.9 miles to be exact. Now imagine that instead of strolling along green lawn you are bobbing in the middle of a 4 mile wide industry tailings pond, full of sand and a host of known toxins. This distance, indeed the entire area of the District, is minuscule in comparison to the Athabasca extent. And don’t forget the future, already approved extent of mining not yet begun. Or the much larger area of surrounding land used for in-situ, or on-site, extraction operations not shown in this animation; here’s a pic showing the landscape impact of in-situ development. As citizens and policy makers alike gear up for the largest protest yet against the Keystone XL pipeline happening this Sunday, November 6 at the White House, it is important to remember that no event occurs in a vacuum. Approval of this pipeline will open up new markets for tar sands oil in the US, Mexico, Central and South America and Europe – and put this already vast mining and extraction operation on steroids. https://skytruth.org/wp-content/uploads/2011/11/SkyTruthMinedAreaandApprovedLands2011.jpg 320 247 Sara Scoville-Weaver /wp-content/uploads/2016/08/test_logo.png Sara Scoville-Weaver2011-11-03 19:38:002019-02-22 11:10:35Tar Sands Mining: Well, Canada is sorta big right? Oil from sand? You better believe it. Question: From which country does the United States receive the majority of it’s oil? Answer: Canada! Not Saudi Arabia. Not Angola. Not Kuwait. Canada. You would be very surprised by how few people know this crucial fact. Or maybe not that surprised, depending on how you answered the above question. Fact is Alberta’s bituminous tar sands have rapidly become a burgeoning force in our oil-driven world. The oil itself is retrieved through “unconventional” methods, as the sands are mined and refined through various processes to extract bitumen and turn it into petroleum. Controversy is raging right now over the proposed Keystone XL pipeline that would bring much more oil from Alberta’s tar sands across the US to refineries on the Gulf Coast – possibly for export to Mexico, Central America and other markets. The U.S. recently began exporting more petroleum than we import. Alberta has experienced a economic boom in only a few short years, shepherding job creation and wealth into the province. However, environmental protests against domestic tar sands expansion and subsequent impacts on local wildlife and the Athabasca River are gaining force. Although industry players draw support through proclamations that tar sands are more “ethical” compared to oil from the Middle East or Africa, carbon emissions from extraction and refining pose significant climate threats to all of us. Regardless of the politics, the actual mining imprint on Alberta’s landscape is impossible to fudge, and getting harder to ignore. See SkyTruth’s Flickr page for satellite images of the Athabasca mines. Above: An animation of Alberta’s tar sands growth, including refining stations, open pit mines and tailing ponds. Below: 1974-2009 mined extent and area approved for tar sands mining. 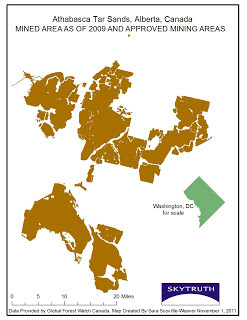 Washington, DC shown for scale. Mine-extent data provided by Global Forest Watch Canada. Infrastructure footprint of in-situ extraction of bitumen using the steam-assisted gravity drainage (SAGD) technique near Cold Lake, Alberta. Each bright rectangular patch is a cleared area about 6-7 acres in size where horizontal wells are drilled to inject steam and extract the bitumen for processing. Drilling sites are spaced about 0.2 – 0.5 miles apart. https://skytruth.org/wp-content/uploads/2011/11/SkyTruth-ColdLake-insitu-GE-2008.jpg 174 320 Sara Scoville-Weaver /wp-content/uploads/2016/08/test_logo.png Sara Scoville-Weaver2011-11-02 21:35:002019-02-22 11:11:13Oil from sand? You better believe it. Speaking of hooey: the extraction and processing of tar sands bitumen into oil has a very high carbon footprint and uses large amounts of fresh water. You can read all about it here. We’re watching the production end of this mess, looking at the steadily growing impacts in Alberta where the tar sands are being exploited, mostly by good ol’ fashioned mining but also by in-situ extraction of bitumen. 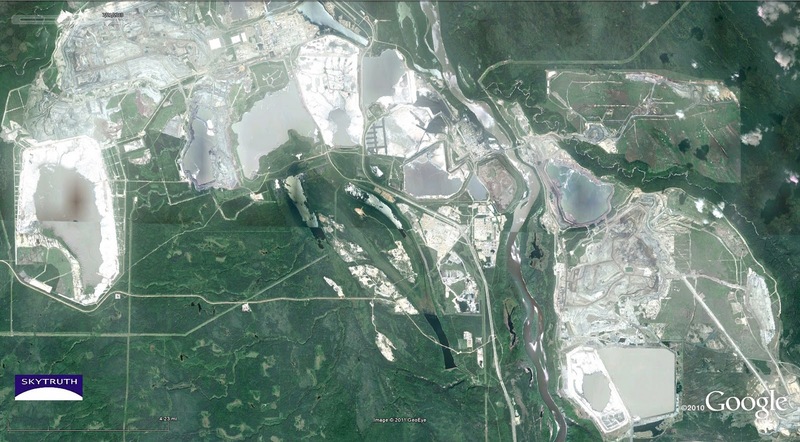 Google Earth now has 2010 high-resolution imagery covering most of the active tar-sands extraction areas, just north of Fort McMurray, Alberta along the Athabasca River. There is also a good database of historical imagery in Google, so you can do some interesting time-series analysis. One thing we noticed – a 7,000-acre forested area of what appeared to be in-situ extraction since 2003 is now cleared and actively being mined. Industry has been touting in-situ extraction as a more “environmentally friendly” way to produce the tar sands, but that’s just PR bull if they’re going to eventually mine it anyway. Here are a few examples to get you started on your own skytruthing adventure of this leading environmental issue. Let us know if you see anything interesting! 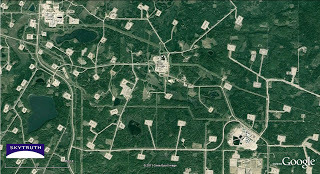 Overview in Google Earth showing part of the tar sands mining complex straddling the Athabasca River about 40 miles north of Fort McMurray, Alberta. High-resolution imagery from 2010. Detail showing 7,000-acre recently cleared area, at upper right in overview image above. Same area as it appeared in 2005, using Google Earth “view historical imagery” tool. 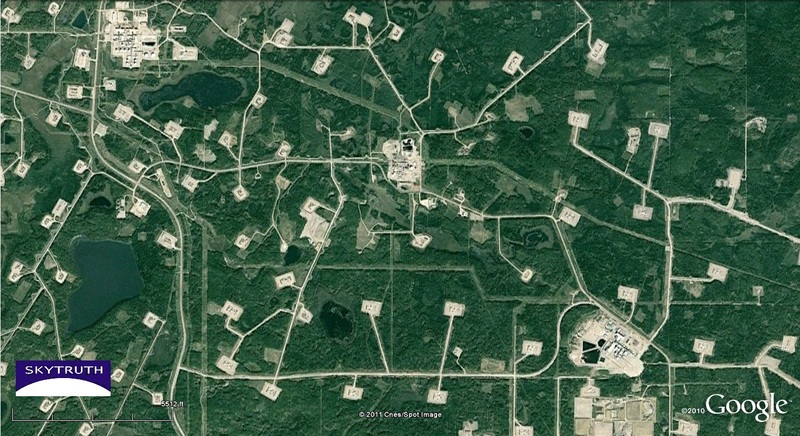 Area is mostly forested in 2005, but marked by regular grid of dirt access roads leading to small clearings that we assume are well sites for in-situ extraction of tar sands oil. Compare with 2010 image below. Recently cleared area in 2010. Apparently in-situ extraction has been replaced by conventional mining. Area was still forested in 2006 but by 2008 logging had cleared most of the land, and conventional mining operations were underway. Compare with 2005 image above. Zooming in even further on the 2010 image, we can see details of the active mining that’s now taking place. And here is what that same place looked like in 2005. /wp-content/uploads/2016/08/test_logo.png 0 0 John Amos /wp-content/uploads/2016/08/test_logo.png John Amos2011-10-17 21:18:002019-02-22 11:16:02Alberta's Tar Sands: In-Situ Extraction Converted to Mining?